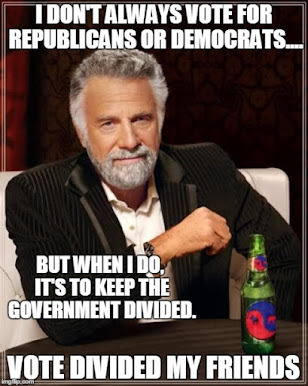 The Dividist Papers: Gallup poll finds record level of independent non-partisan pretension. Gallup poll finds record level of independent non-partisan pretension. 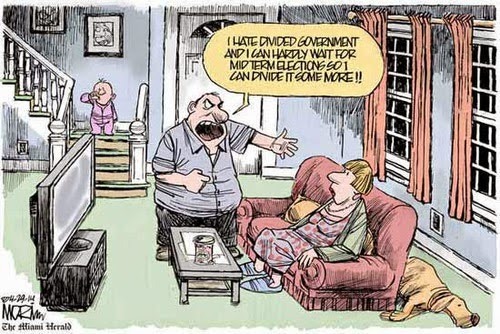 "Americans are increasingly declaring independence from the political parties. 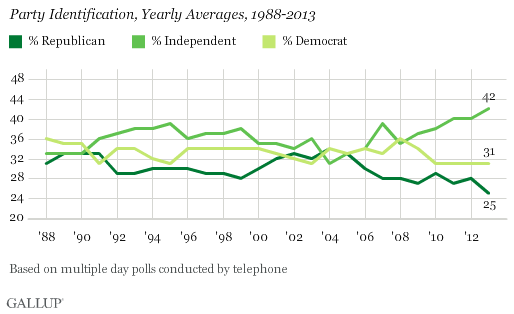 It is not uncommon for the percentage of independents to rise in a non-election year, as 2013 was. Still, the general trend in recent years, including the 2012 election year, has been toward greater percentages of Americans identifying with neither the Republican Party nor the Democratic Party, although most still admit to leaning toward one of the parties." This was greeted with the usual triumphalism from moderates, centrists and independents living in the hope of an imminent implosion of the political duopoly. But there is far less here than meets the eye. Professor John Sides of the Washington Post Monkey Cage Blog explains most "independents" are actually "independent leaners" and..
" independents who lean toward a party — or “independent leaners” — behave like partisans, on average. They tend to be loyal to their party’s candidate in elections. They tend to have favorable views of many political figures in their party. They are not much more likely to identify as ideologically moderate. To be sure, independent leaners are not as partisan as the strongest partisans. But they resemble weaker partisans much more than they do real independents. In actuality, real independents make up just over 10 percent of Americans, and a small fraction of Americans who actually vote." Got that? Real Independents, meaning voters who will change their party vote from one election to the next, represent as little as 10% of the electorate. Why do such a large preponderance of Americans tell pollsters they are independent, but vote like rabid partisans? "We find that stories of partisan disagreement diminish people’s willingness to discuss partisan politics with others or to participate in other overtly partisan actions. Even more importantly, the more people care about what others think of them, the more likely that people will shy away from behaving in a way that makes them appear partisan. This is just a portion of our findings regarding the extent to which people prefer “independence” – but equally important is what we don’t find. What we don’t find is any change in people’s actual political views. Even while reporting that they are independent, respondents repeatedly clung to the partisan issue positions they had held all along... Certainly, there are many people who may be truly independent from either party and who may behave in the ways we might expect true independents to behave. But our work points to the idea that “independent” has become a socially desirable label – one that conveys a sense of rising above the political pettiness in American politics. And even as more and more people call themselves “independent,” it is difficult to argue that they are actually moving away from their underlying partisan identities." This is an important finding for the very few True Independent voters who still cling to the hope of an emerging third party, "third way" or resurgent centrist/moderate majority in American politics. It ain't there. It ain't coming. Get over it. 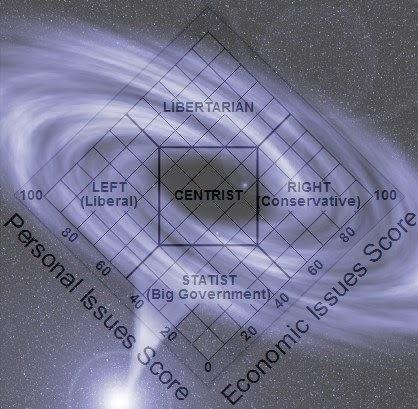 The Dividist pontificated on the meaning of this phenomena before, notably in his epic rant "The Centrist Granfalloon". It's worth noting that most of the centrist / moderate / independent blogs linked in that post have either evaporated into the blogging ether or stopped posting since that 2011 post. Just sayin'. Here is any easy self-test to figure out if you (or anyone else) are partisan or a true independent. Have you voted only for Democrats for President, Senator, and Representative in the last 20 years? If you cannot name one Republican you have voted for federal office I don't care what you call yourself, you are a partisan Democrat. Have you voted only for Republicans for President, Senator, or Representative in the last 20 years? If you cannot name one Democrat you have voted for federal office I don't care what you call yourself, you are a partisan Republican. If it looks like a duck, walks like a duck, quacks like a duck - it's a duck. If your voting record at the federal level is indistinguishable from a rabid partisan - You're a rabid partisan. Some of my best friends are partisans. Sure you've done questionable things. Revel in your time.